Starline #SL230SS - 18-8 Stainless Steel dual wall, Copper lined vacuum insulation - 9"h x 4.625"w x 2.875"d - Vacuum insulation provides optimum heat retention at least 7X longer. 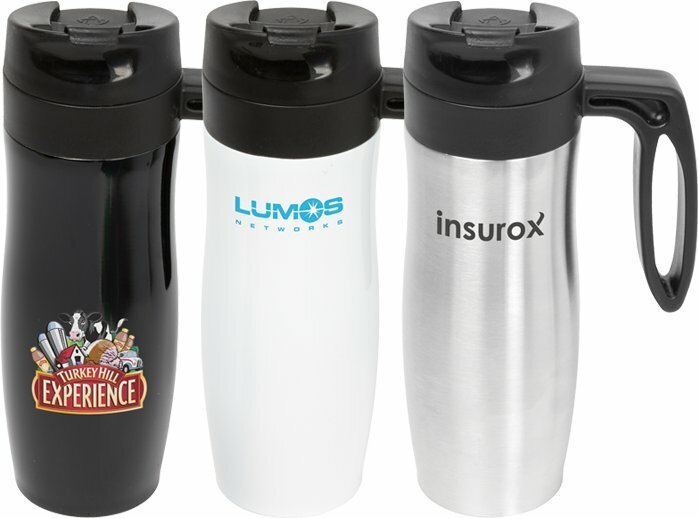 Constructed of FDA compliant materials Features a removable twist handle that can convert your travel mug into a tumbler. 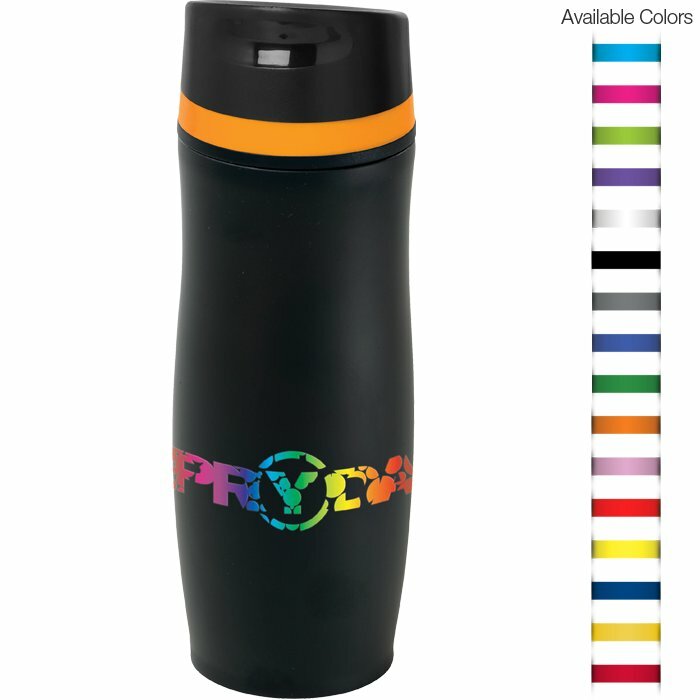 Includes a flip top lid design with snap locking closure Features 2 black bands at base. Hand Wash Only. Keep hot beverage HOT for 6 hours or more and cold beverages COLD for 24 hours or more. From $23.29 each plus $60 set up. Starline # SL478SS - 18-8 Stainless Steel dual wall, Copper lined vacuum insulation. - 9"h x 4.625"w x 2.25"d - Vacuum insulation provides optimum heat retention at least 7X longer. 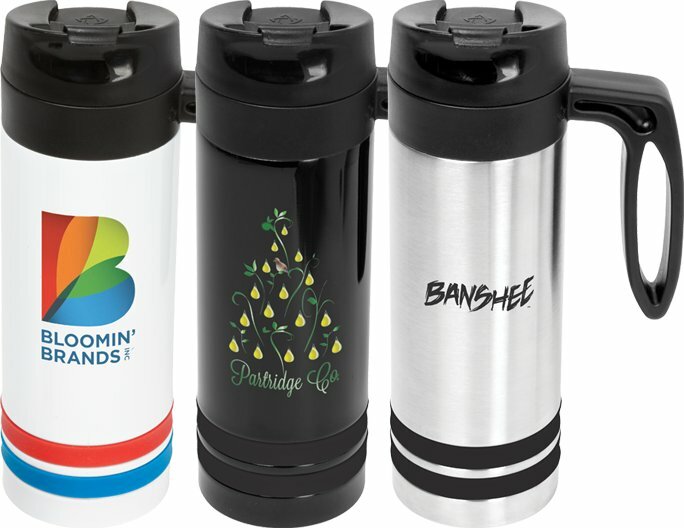 Constructed of FDA compliant materials Features a removable twist handle that can convert your travel mug into a tumbler Includes a flip top lid design with snap locking closure. Hand Wash Only. 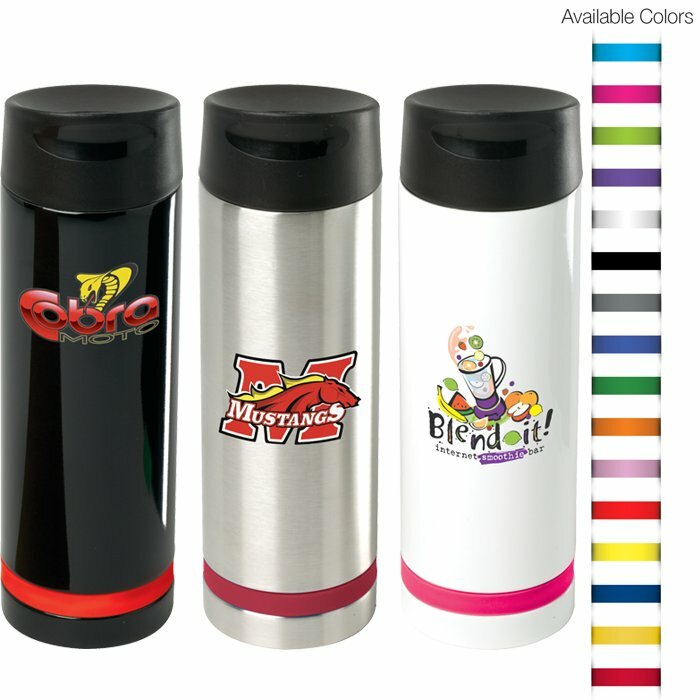 Keep hot beverage HOT for 6 hours or more and cold beverages COLD for 24 hours or more. Starline # SV95BM - 8.25"h x 2.75"w x 2.75"d - 18-8 Stainless Steel dual wall with black matte finish and Copper lined vacuum insulation. Vacuum insulation provides optimum heat retention at least 9X longer. 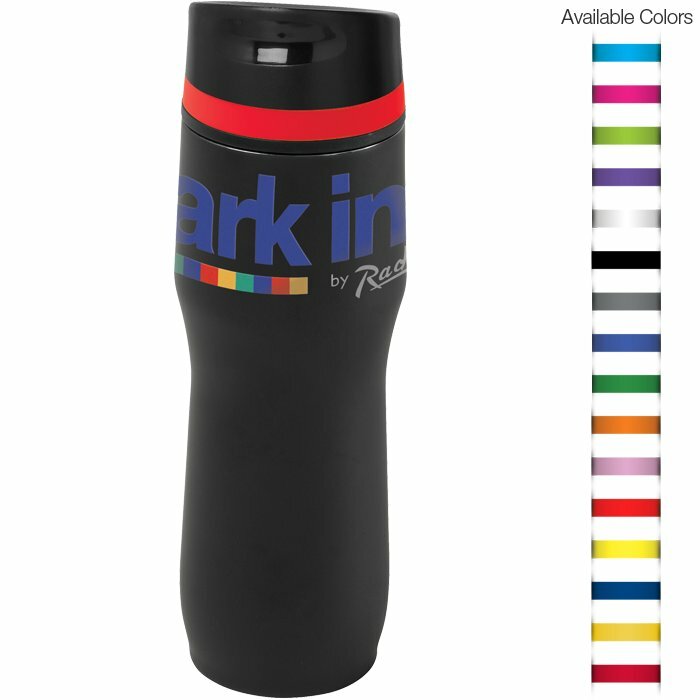 Features a lip groove that allows you to position the drinking spout without even looking. 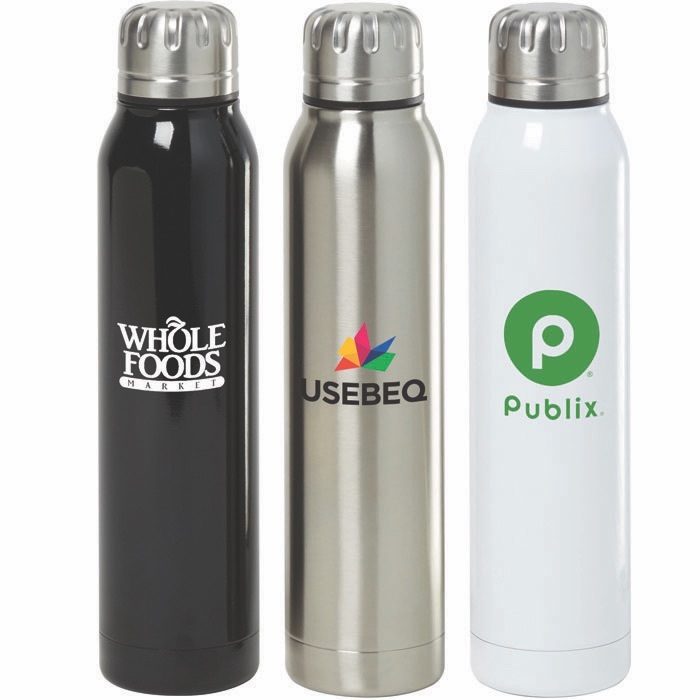 Includes a leak proof screw-on lid with a visual open/close push button locking closure. Lid can come apart for easy cleaning. Available in a variety of 16 different colors. Hand Wash Only. 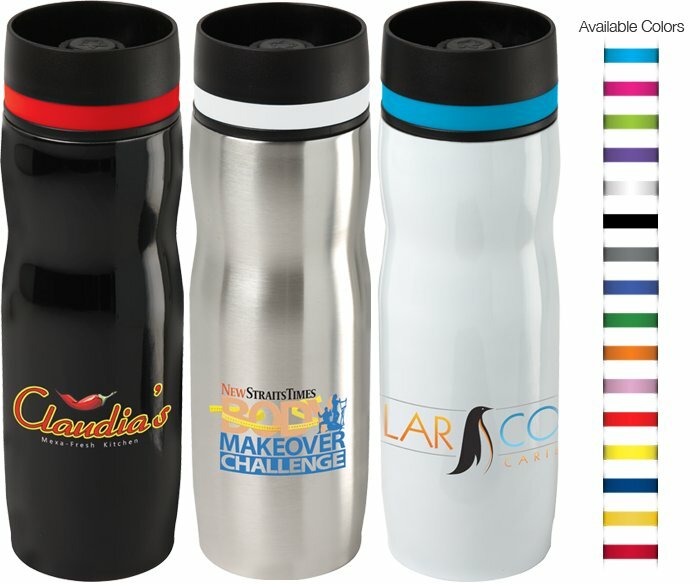 Starline # SL237SS -FDA Compliant 18-8 Stainless Steel Includes a deep draw liner with copper lining Features a patent pending 360 degree push-button drink-thru lid Lid can come apart for easy cleaning Available in 16 color accent bands Keep hot beverage HOT for 6 hours or more and cold beverages COLD for 24 hours or more. From $22.79 each plus $60 set up. Starline# SL312BM - Black Matte finish 18-8 Stainless Steel dual wall with black matte finish and Copper lined vacuum insulation. Vacuum insulation provides optimum heat retention at least 9X longer. Patented - Tru Colour Imprint. Features lip groove that allow you to position the drinking spout without even looking. Includes a leak proof screw-on lid with a visual open/close push button locking closure. With 16 accent color options. - Lid can come apart for easy cleaning. - 9.25"h x 2.75"w x 2.75"d - Hand Wash only. From $23.49 each plus $60 set up.